This was the first chance I've had to put the ZWO ASI071MC through some serious long exposure tests on four very different targets, the region around Alnitak in Orion, the Rosette Nebula, Markarian's Chain, and M101. I ran most of these frames with unity gain (90 Gain, 20 Offset), and I built up a nice library of dark calibration frames in the afternoon, for 600, 300, and 120 second exposure times. 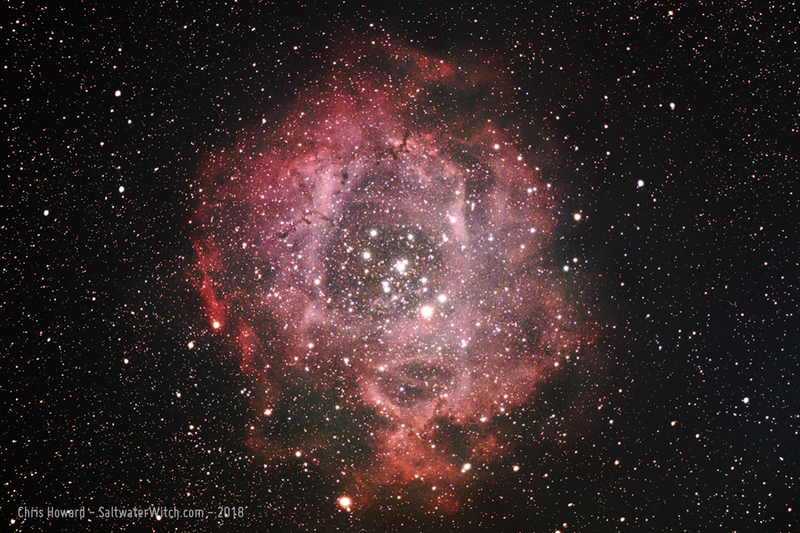 Rosette Nebular Region - Caldwell 49 (13 x 300 sec frames, 24 dark calibration frames) in the constellation Monoceros, about 5000 lightyears from earth. William Optics GT81 APO refractor, ZWO ASI071MC-C camera, iOptron CEM25P EQ mount. A whole string of galaxies millions of lightyears from earth. 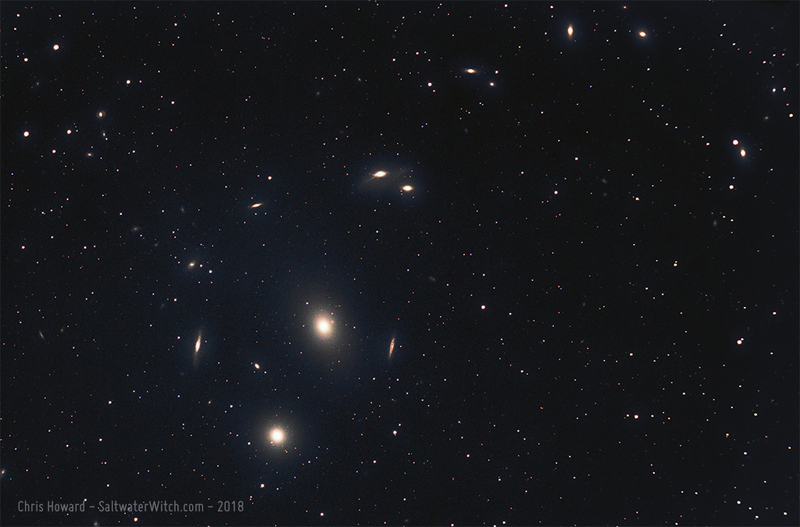 Markarian's Chain in the Virgo Cluster, including M84, M86, the Eyes Galaxies (NGC 4435 and NGC 4438) and a few more galaxies and galaxy pairs. The Eyes are 52 million lightyears away! 30 x 120 sec frames, 20 dark frames, stacked in DSS. William Optics GT81 APO refractor, ZWO ASI071MC-C camera, iOptron CEM25P EQ mount. 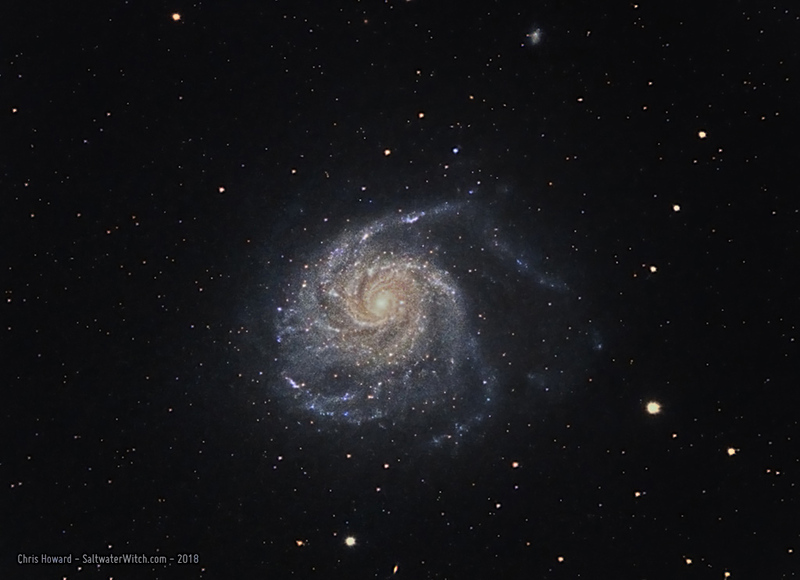 Pinwheel Galaxy, M101, a spiral galaxy about 21 million lightyears from earth in the constellation Ursa Major (Big Dipper). (Light frames: 10 x 120 secs, 4 x 600 secs, 12 x 300 secs). 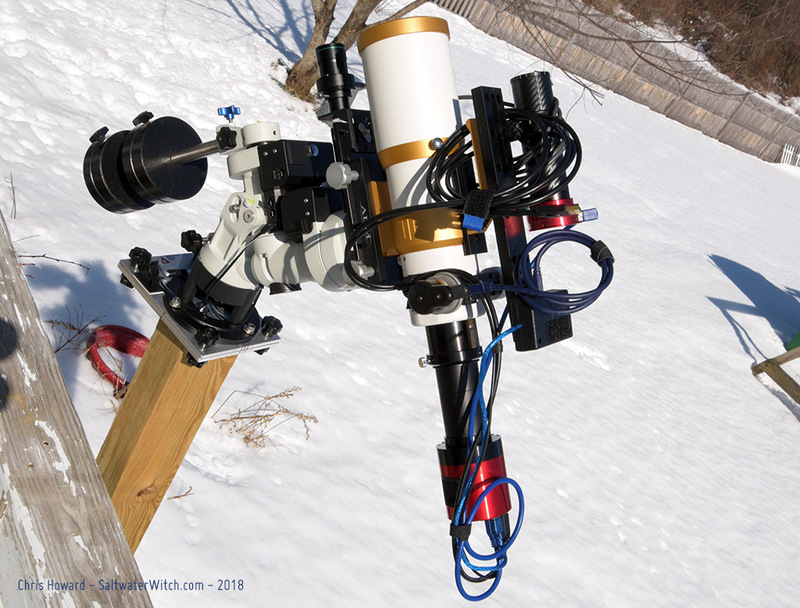 William Optics GT81 APO refractor, ZWO ASI071MC-C camera, iOptron CEM25P EQ mount, INDI/KStars/Ekos. 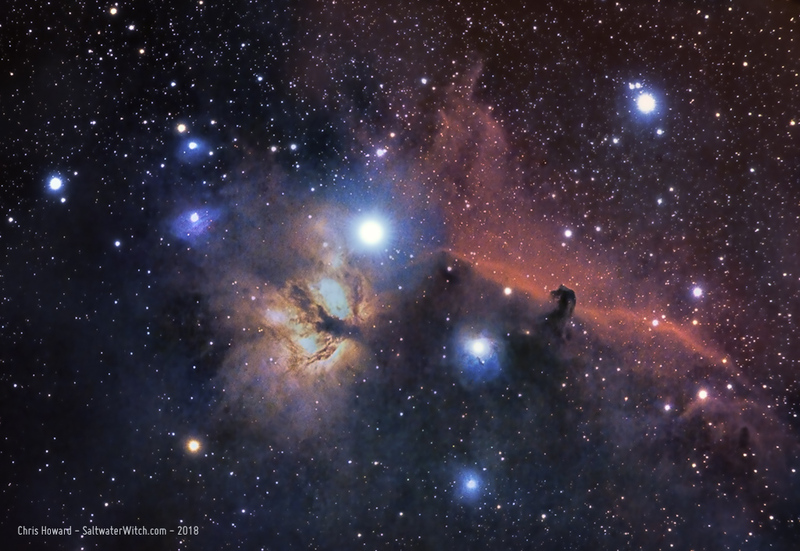 Part of the Orion Molecular Cloud Complex that surrounds the blue supergiant Alnitak (large star in the center), including the Flame Nebula (NGC 2024), IC 434, Horsehead Nebula (Barnard 33), NGC 2023, IC 431, and more. About 1500 lightyears from earth. (22 x 300 sec frames, 24 dark frames). William Optics GT81 APO refractor, ZWO ASI071MC-C camera, iOptron CEM25P EQ mount. In case you're wondering, I'm pretty damned excited about this camera (ZWO ASI071MC), just going off what it can capture in faint nebulosity, and what I can bring out without much effort by stretching 22 stacked frames. I can't wait to see what I can capture in the summer when the big galaxies like Andromeda and Triangulum swing through. Here's my setup for last night's astro session, with the William Optics GT81 APO refractor, ZWO ASI071MC-C primary camera, iOptron CEM25P EQ mount.